When you think of elephants, you may immediately think of their defining characteristics: trunks, big ears, tusks. Or you may think about how they live in large family groups and are very social. You may even think about the story of the blind men and the elephant. You probably don’t think about them as engineers of their ecosystem. But they are. Elephants are native to the Serengeti ecosystem, but Serengeti elephants were likely all killed off for ivory in the 1800’s. At least, there weren’t any recorded there until the middle of the twentieth century when they started moving back in again. In the 1960’s they migrated in from both the north and the south, and by 1970 there were over 3,000 elephants in the Serengeti. Things got rocky for elephants again in the 1980’s as severe poaching reduced their numbers in Serengeti National Park to around 500. In 1988, elephants were given CITES endangered species status and worldwide trade in ivory was banned. This was good news for Serengeti elephants and their numbers rebounded again into the thousands. These ups and downs in elephant population have allowed scientists to study the impact elephants have on their environment. I’ve written before about how the rainfall patterns in the Serengeti affect grasses, and about the role that fire plays. Elephants have their greatest impact on trees. Elephants eat both grasses and trees, but depend on trees for food during the dry season. In the first half of the twentieth century, the number of trees per hectare was slowly declining across the Serengeti. But starting in the 1970’s, the number of trees rapidly increased. Scientists believe that the initial decrease in trees was due to the the disease rinderpest. Rinderpest killed off the majority of Serengeti’s wildebeest, allowing the grass to grow tall, and fueling huge, strong fires. These fires killed most tree seedlings, meaning that as trees died, they were not being replaced. When rinderpest was halted, the wildebeest population exploded, and the wildebeest kept the grass short and the fires smaller, allowing trees to gain a foothold once more. Okay, but what about elephants? Well, elephants eat trees — especially small, tender saplings and regrowth from trees damaged by fire. In the 1980’s, while poaching was particularly severe on the Tanzanian side of Serengeti (Serengeti National Park), the Kenyan part of Serengeti (Maasai Mara) mounted a strong anti-poaching effort and kept its elephant numbers high. Across the Serengeti, the trees were increasing, but in the Maasai Mara there were also a lot of elephants. It turns out that in the Maasai Mara, the trees didn’t increase like they did across the border in Tanzania where the elephants had been greatly reduced. Instead the high number of elephants in the Maasai Mara is keeping tree numbers down, despite the reduction in fire intensity. So elephants are key players in maintaining what scientists call “alternative stable states” in the Serengeti. While there are plenty of elephants once again in the Tanzanian part of the Serengeti, they don’t reduce the higher tree numbers; only fire can do that. 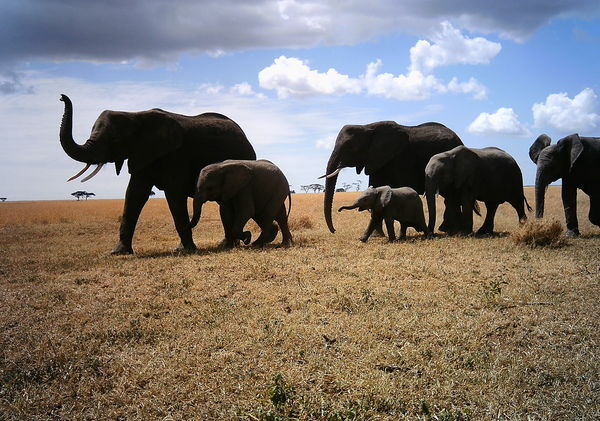 But on the Kenyan side of the border, tree numbers remain low because elephants there have been continuously eating saplings; the tree population cannot increase because of the constant elephant pressure. The key difference between the two areas is simply their history. I think the fourth blind man should get extra credit.